This post was inspired by an inquiry from a reader of this blog. He wrote me to ask about the tools John Stanley used as a cartoonist. I replied that I had no answer to his question. I don't think John Stanley ever spoke to anyone, on the record, about how he drew comics. He was as talented an artist as he was a writer. The latter skill paid the bills, and let's face it: comix art is a time-consuming process. A lot of thinking and mucking-about goes into the writing process, but it is a purer and simpler form of creativity. To write, you just need an idea, a writing implement, and something to write on. It can be the back of an envelope or the blank pages of a paperback book. Once an idea is down on paper, you've got it. You can refine it, fancy it up, but it's still the same idea, whether good or bad. 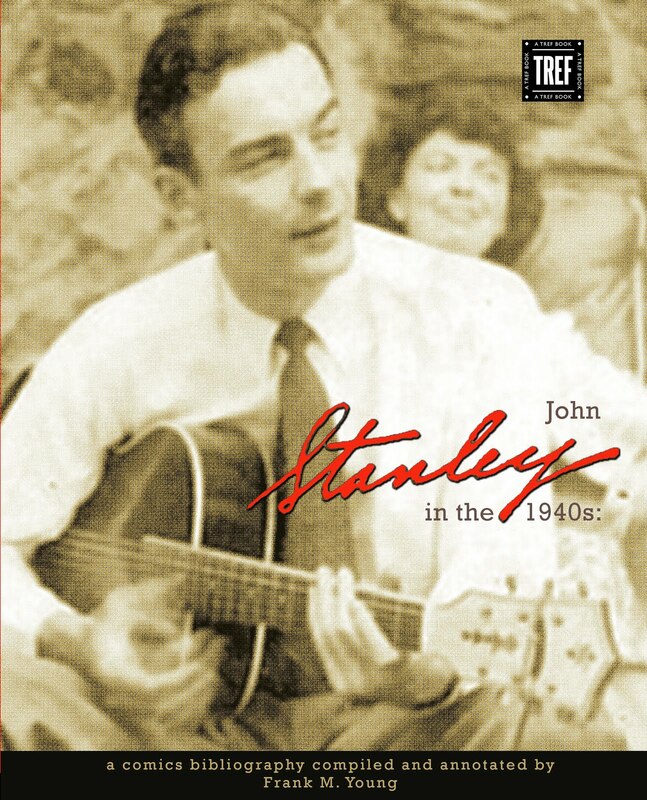 John Stanley made his living by being a peerless "idea man." I believe that Walt Kelly used this term to describe Stanley, and that he deemed him the best there was. 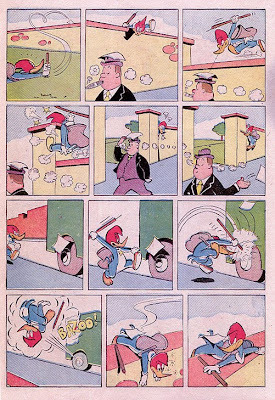 With Kelly and, on the West Coast, Carl Barks, Stanley was a richly talented hyphenate. He could create strong ideas, interesting characters and high-stakes situations. He could also illustrate these ideas with elan. 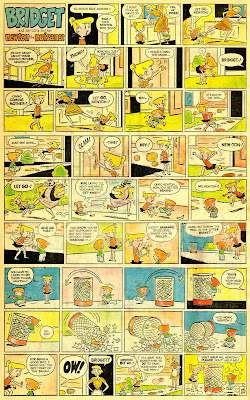 Stanley's worth as a writer seemed to dominate throughout his comix career. He wanted to be a cartoonist and, when sufficiently inspired, he would take his ideas to the drawing board. The results were strikingly different from Barks' or Kelly's. Although Stanley had some experience in animation, this work did not inform his cartooning style--certainly, not to the extent that it flavored Barks' and, especially, Kelly's. Stanley aligned himself with the magazine gag cartoonists of his day. They generally drew in clean lines, with all figures and settings calculated to instantly "read" and be understood. Although many magazine cartoonists favored lush wash renderings for their pieces, the basic rule of their work was "less is more." Minus the Disneyian folds and wrinkles, minus the feathering and painstaking attention to detail, John Stanley's cartoon style has a sleek, streamlined look, whether it's rendered in pen and ink or brush. It's as distinctive as the "tics" in his writing. Yet John Stanley, the cartoonist, is often overlooked in discussions of his work. Stanley's skills as a writer of entertaining, literate, troubling narratives are remarkable. I cannot think of a finer writer in American mainstream comix. But Stanley has a considerable body of published work as writer AND cartoonist. While his artwork has been critically admired, I don't think anyone has ever stopped to look at how it changed over the 20-year span of his published comic book work. Here is a brief but lavishly illustrated survey of the stylistic tendencies of John Stanley's comic book cartooning career. 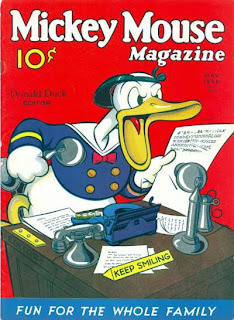 John Stanley began his long association with Western Publishing, producer of the Dell Comics line, in 1943 as a writer. Arguably, the association began a few years earlier. 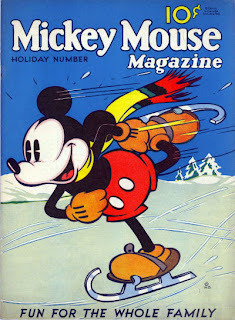 Stanley was among the staff of Mickey Mouse Magazine, the immediate precursor to Walt Disney's Comics and Stories. It's known that Stanley drew some covers to MMM. Most of the magazine's covers can be seen HERE. I don't claim any of these are Stanley's work. Whomever did them, they're good covers. These cover images set the standard for comix covers in the 1930s, '40s and beyond. 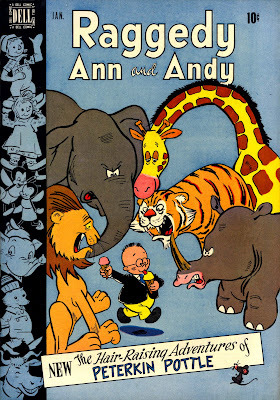 Among Stanley's first fully realized comix works were his "Andy Panda" stories for New Funnies and "Tom and Jerry" for Our Gang Comics. I'm not aware of any surviving scripts or drafts from Stanley's 1940s Dell work. How did he write his stories in the 1940s? Did he write scripts, or was he already drawing his pages out, in rough, expressive pencil sketches, and passing those along to the staff artists who produced the finished work? Any cartoonist would be able to understand what Stanley intended in the attitudes and emotional states of his characters. His rendition of Oona Goosepimple is far more macabre and Charles Addams-creepy than Dan Gormley's final versions. 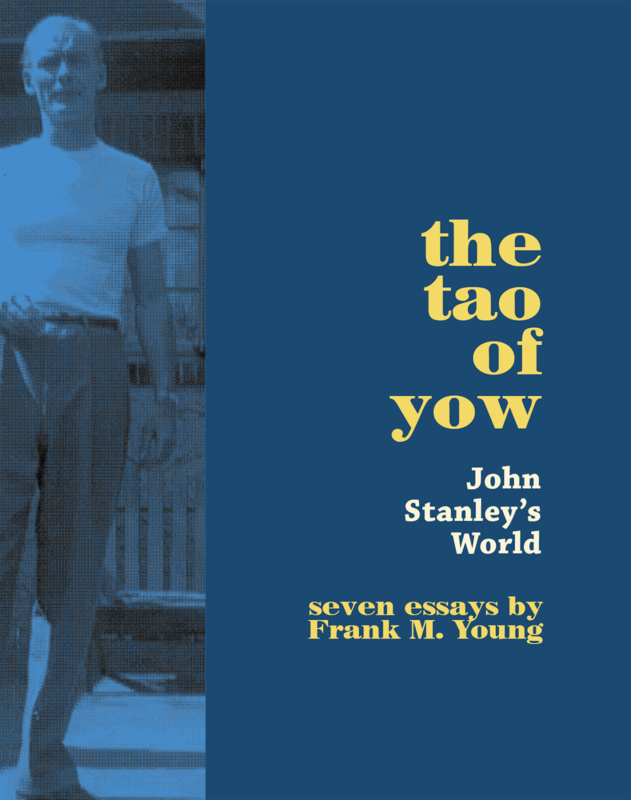 You can read some of Stanley's earlier "Andy Panda" and "Tom and Jerry" stories elsewhere on this blog. They have in common a clean, clear staging, with an innate sense of how to arrange characters and objects in the panel/frame. Stanley's figures scan well, and, for the most part, he was blessed with high-quality finishes of his probable script-pencils. 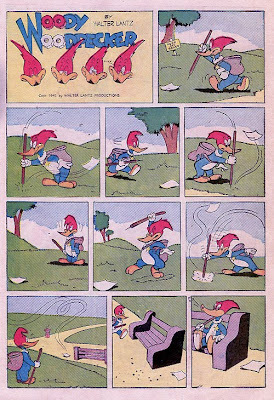 In 1944, Stanley picked up the "Woody Woodpecker" feature in NF. 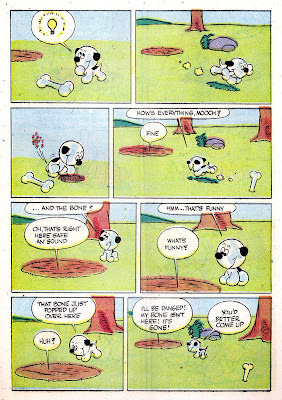 This was Stanley's first significant comix series. He shaped the unappealing character of Woody Woodpecker into the first of his highly recognizable "Tubby Types." The character obviously appealed to Stanley, and triggered strong comedic ideas. In 1945, he began to illustrate this series. 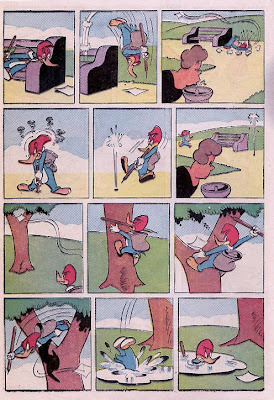 Here is Stanley's first self-illustrated "Woody" story, from issue #102. I regret the smallish size of these scans. This story is wordless. The inking is unusually slick and lush. It's unlike any of Stanley's inked drawings I've seen. I suspect that another artist did the ink finish to Stanley's pencils. 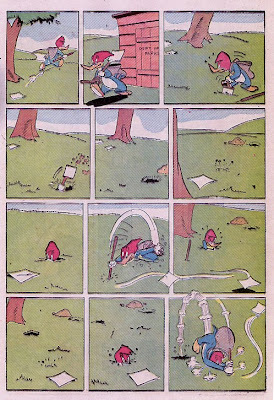 Around this time, Stanley began his most lauded and important work in comix. 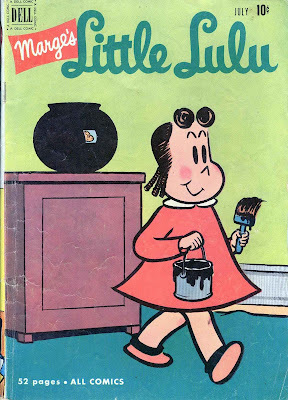 He created the first comic-book adaptation of Marge Buell's popular magazine panel cartoon, Little Lulu. 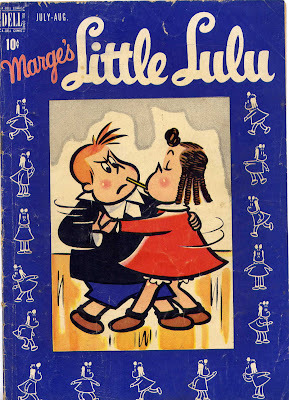 It was one of many licensed properties that dominated the Dell Comics imprint over the next 20 years. 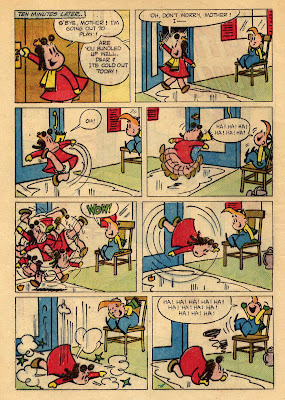 After three years of increased appearances in Dell's "Four Color" series, Little Lulu began a long regular run in 1948. 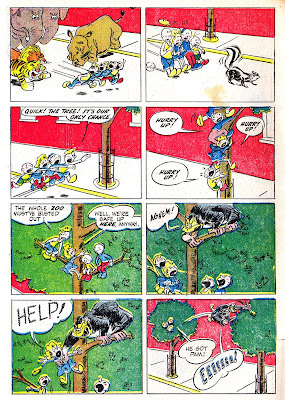 The nine "Four Color" issues of "Lulu" contain John Stanley's first significant, consistent run as a total comix creator. They contain beautiful cartooning, albeit in the shadow of Marge's airy, broad style. 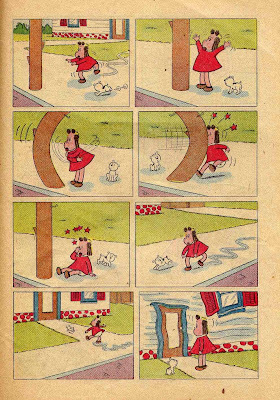 Here are three "Lulu" panels by Marge Buell, from 1935 to 1943. Marge's cartoon style is borderline-primitive, but she sells her gags clearly and concisely. 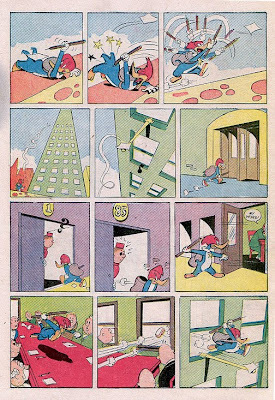 It is a curious cartooning style, and it took Stanley a bit of trial and error to make it work on the four-color comic book page. 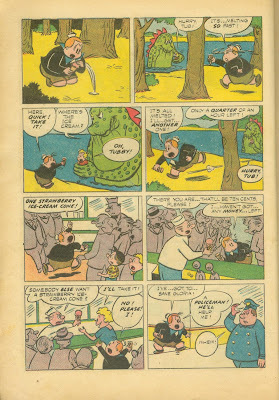 Here's a sample page from Stanley's first "Four Color" Little Lulu (#74, 1945). It's good, clear cartooning. Stanley's lines are rendered in uniform thickness, in what looks to me to be exclusively pen work. Even Lulu's hair "meatballs" are rendered in the crabbed scrawl of a nib. By the final Four Color Lulu (#165, 1947), Stanley had surrendered the final ink finishes to assistants Charles Hedinger and Irving Tripp. 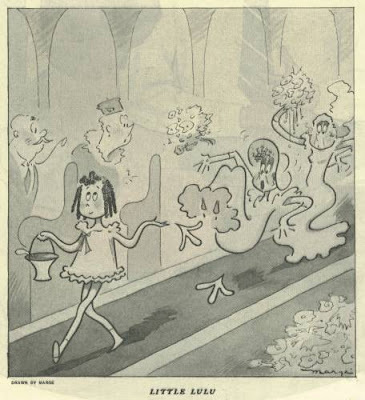 This was published around the time of Stanley's lone cartoon for The New Yorker. See HERE for a post on that cartoon. Stanley's hand as an artist is lessened by this time, but his staging and character designs are still strongly in evidence. 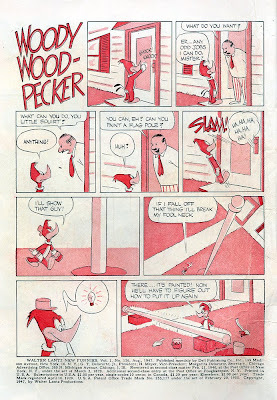 This wordless page features a dog very similar to the "Jigger" character from Stanley's first original series for comic books, "Jigger and Mooch," which ran in late issues of Animal Comics. Stanley's pen line is alive and exciting on these pages. Every character (and inanimate object) seems to live and breathe. In the wake of his very tight, controlled work of the era, these "Woody" pages are a breath of fresh air. 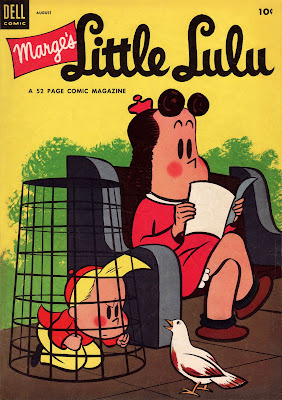 Stanley drew the covers for the Lulu comics through the end of the 1950s. At first, he used the same tight, unvaried pen line for those cover illustrations. Notice how much looser the first and last examples are. That tightly controlled line crept into the "Lulu" covers around 1951. I find the two center images much less appealing than the first and last ones. When Stanley lets go as a cartoonist, and surrenders some of his control, the results have a living, breathing quality that is dynamite. 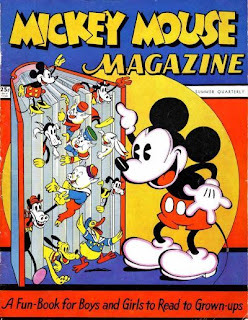 Stanley muted his highly identifiable cartooning style for these poster-like cover images. Occasional tells peek through--usually in background details, or when animals and toys are part of the picture. "Pottle" shows Stanley pushing past the limitations of the Buell/"Lulu" style. 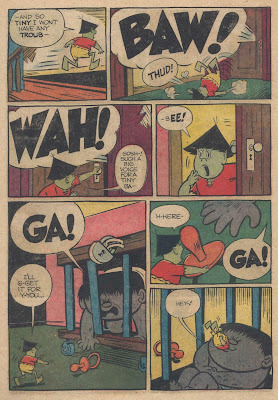 The figures, settings and even the coloring of the "Pottle" pages suggests the influence of UPA-school cartoon modern artwork. 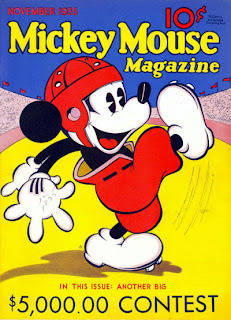 At the time, this look was rampant in advertizing, and was a strong influence in film animation from the early 1940s. Stanley affects a loose, deceptively casual brush line in this series. While I have mixed feelings about the content of "Peterkin Pottle," its look is disarming and contemporary. 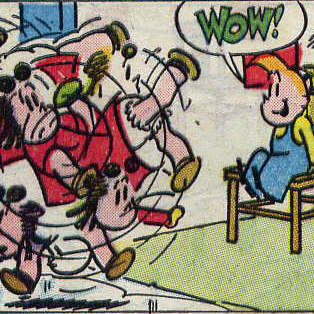 With a few very rare exceptions, Stanley surrendered the art finishes to Irving Tripp, Lloyd White and other Western staffers as the monthly Little Lulu comic book became more popular. Tripp proved a capable ambassador of the Stanley style. He seems to have really understood Stanley's sense of humor. Tripp's artwork is tight and confident. It has considerably less "soul" than Stanley's cartooning. But the combination worked like a well-oiled machine for a decade, and through hundreds of published pages. 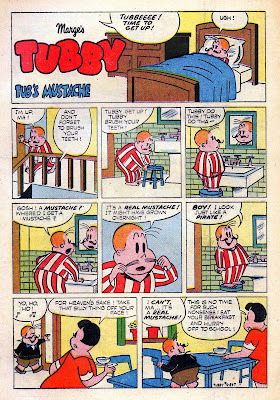 This one-off issue foreshadowed Stanley's only sustained comics work of the 1950s: issues 2 through 9 of the "Lulu" spin-off title, Tubby. Stanley's work on Tubby shows a desire to return to the tightness of the "Jigger and Mooch" cartooning, but with more emphasis on dynamic motion, character and body language. The characters, especially the villains, adults, and non-series figures, are often drawn in a cartoon shorthand. Ears, noses and other facial features are suggested, but not strongly rendered. Stanley let more of the cartoon modern influence seep into his pages for Tubby. Here are two sample pages from issues 8 and 9 of Tubby. This is among my favorite cartooning of Stanley's. Here, he found a bridge between control and chaos. There are, by the way, several examples of these Stanley-drawn "Tubby" stories throughout this blog. Ditto for the other series sampled here. Dig around for full stories. Stanley's end of his Tubby run also put a stop to his published cartoon art until the 1960s--with a couple of exceptions. Stanley's finished cartoon art appears in the third and fourth Lulu giant-size specials. 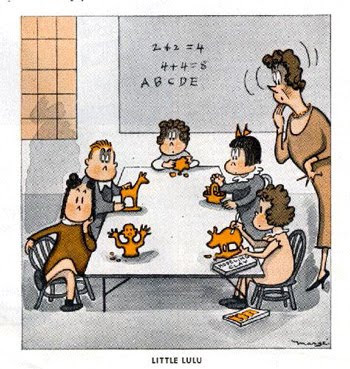 These pieces, done in 1955 and '56, are the last we see of Stanley the cartoonist until 1963. While much of Stanley's finest comics writing was done in the mid-to-late 1950s, the lack of his sequential cartoon art is painful. 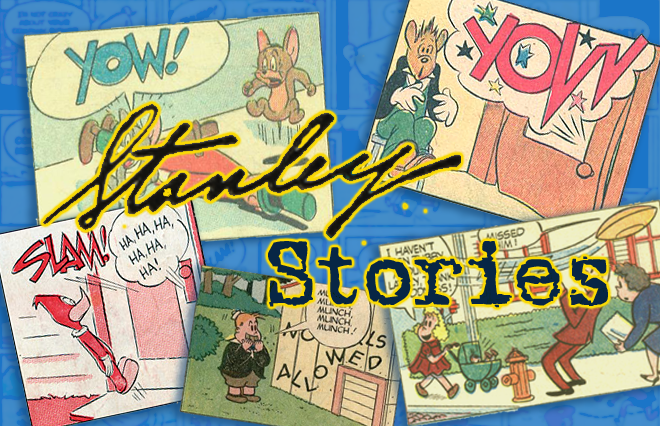 Stanley had developed his cartoon style to a second peak with the Tubby series. Unable to sign his work--even for series he had created from scratch--perhaps Stanley felt discouraged as an artist. As well, his sheer workload as a writer may have prevented him from the more time-consuming efforts of inked "finishes." He did continue to draw the scripts for all his stories. Flashes of his style break through in the artwork of Irving Tripp, Dan Gormley, Lloyd White and the other Dell staffers who rendered the published versions of his narratives. 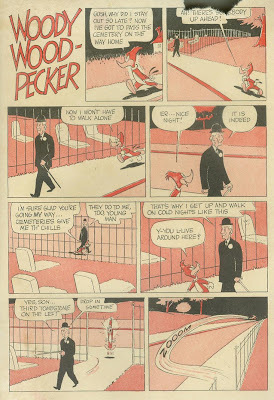 Stanley's finest collaborator in this period was Bill Williams, whose spirited, adroit artwork for the series Kookie and Around the Block with Dunc 'n' Loo (two original comic book creations of Stanley) is in perfect sync with Stanley's snappy, quick-witted writing. Williams' cartoon style overpowers Stanley's, and Stanley seems to have willingly surrended his visual input for the sheer chutzpah with which Williams sells these high-energy, razor-sharp pieces of "sitcomix." 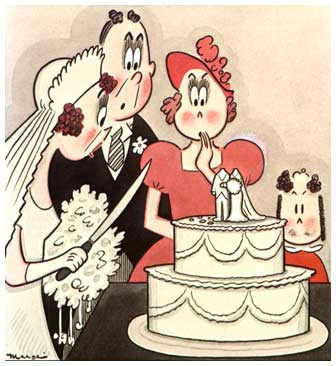 It is a profound pity that there are no published examples of John Stanley's cartooning, aside from comic magazine covers, between 1955 and 1963. 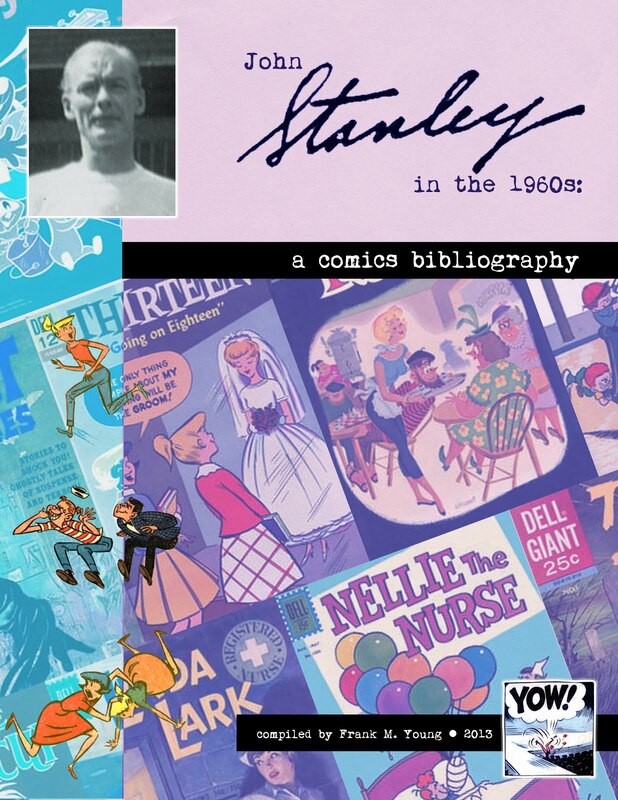 At that time, with Dell having split away from its once-lucrative licensed properties, and desperate for new titles, Stanley worked again as a cartoonist-writer. He was finally allowed to sign his work. Stanley's 1960s style is a mature, engaging blend of his tighter clean-line pen work and his looser "Lulu" cover/"Peterkin Pottle" brushwork. 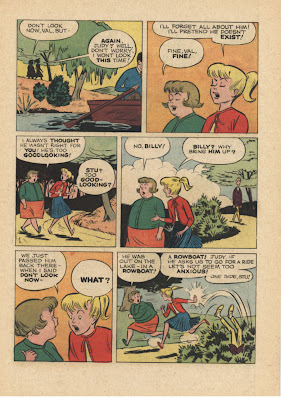 Stanley's first new series for 1960s Dell was a teenage "humor" comic book, Thirteen Going On Eighteen. Its first two issues are a far cry from the sublime highs of Bill Williams' work. They are illustrated by Tony Tallarico, a cartoonist whose work filled many Dell titles of the decade. Tallarico was clearly inspired by Stanley's writing. His artwork for those first two issues shows a level of TLC unseen in his typical work. Those two Tallarico-drawn issues are his finest efforts. Something didn't click with this series, despite Tallarico's earnest applications. Thus, John Stanley returned to regular cartooning. Stanley got rid of the dreadful Tallarico character designs and quickly got into the flow of the series' artwork. Here, once again, the tension between control and abandon gives his 1960s artwork a high visual voltage--even when the bulk of the series is "talking head" dialogue sequences. Here's a random page from issue #25 (the last original issue of the series, dated December, 1967). How far Stanley had come in four years' time! Here is a fully realized, highly individual cartooning style. 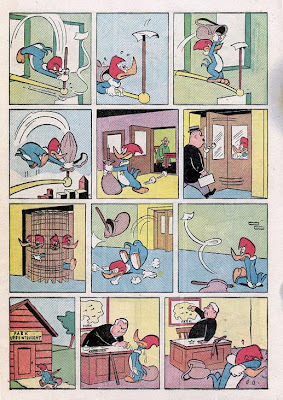 It also shows a maturity in figure composition, body language, and an accent on depicting the essentials of each panel--the tenets of magazine cartooning again dominant in his work. 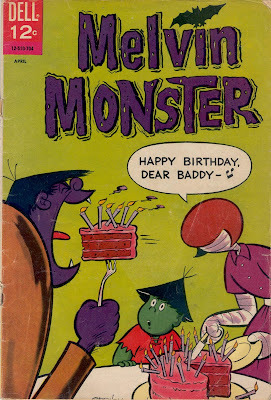 Stanley gave himself more artistic room in his other major series of the era, Melvin Monster. While its style is similar to 13, Stanley enjoys the cartoony quality of his characters. They do not live in a real world; there's no need to affect the soft quasi-realism of 13. The highly stylized figures of Melvin Monster, and its use of large areas of black, bold freehand panel borders, and highly inventive handmade typography, mark this as powerful, compelling cartoon art. 1967 was the last year of regularly published comic art by John Stanley. He wrote a couple of other comics for Gold Key in the late 1960s. These late works appear to have been light-boxed by the staff artist from Stanley's pencil-drawn comix scripts. 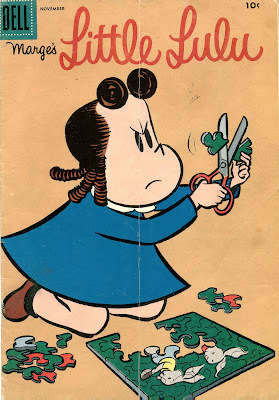 "Bridget" is a return to the "Little Lulu" school of comix. Stanley also returns to the use of pen. After all those expressive brush lines in his '60s comix, the more controlled, assured pen line of "Bridget" brings his early and late styles together for a poignant farewell to the cartooning world. 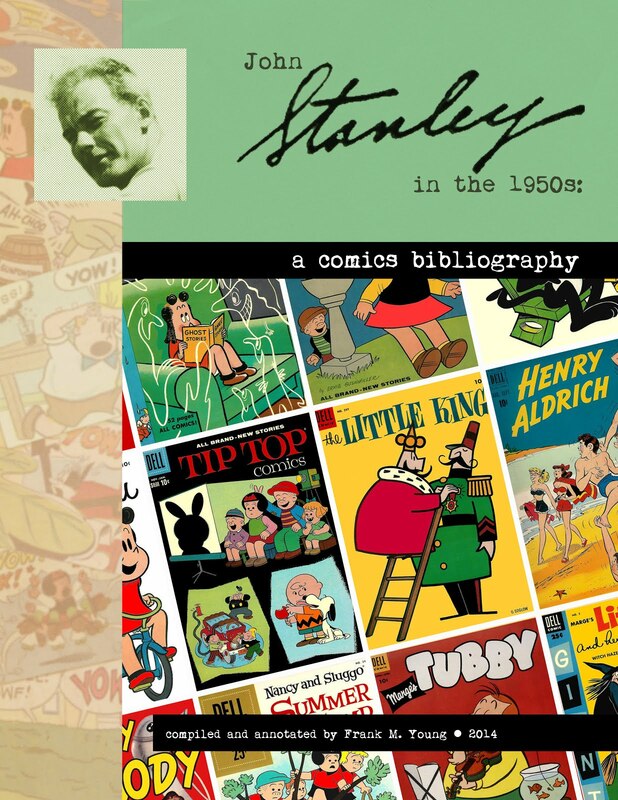 With Stanley's art and writing back in print, via Drawn + Quarterly's John Stanley Library and the Spiegelman/Mouly-edited Toon Treasury of Classic Children's Comics (buy 'em if you haven't got 'em! ), I think this examination of John Stanley, the cartoonist, is long overdue. There is more to be said, but I hope this survey gives you a sense of Stanley's development as a world-class comix artist. This is an incredible post, Frank. Thanks so much for all the hard work. 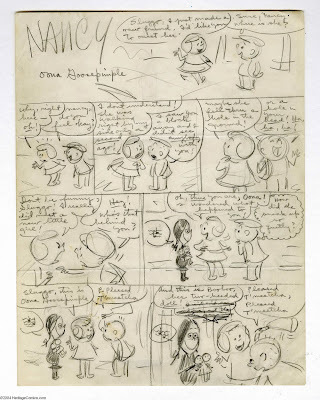 It was really sweet to see Stanley's rough story sketch for Nancy. It's so complete. There's not much there for the artist to interpret. I wonder if he worked that complete with everyone he worked with. Looking back on the Dunc 'n' Loo stuff you've posted, I have to say I'm a huge fan of Bill Williams artwork. He was a fantastic artist. Superb work, Frank! Incredibly interesting and informative. 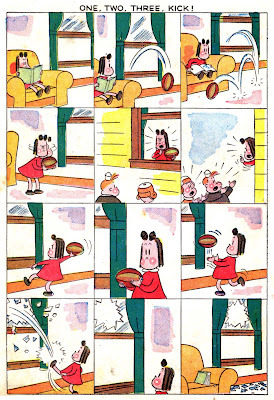 It's fascinating to see the evolution (and de-evolution) of Stanley's cartooning style. Your article also works as a great survey of his career in comics, something I had never before gotten a handle on. And may I just get on my soapbox here and say that it's high time John Stanley got some recognition as an ARTIST and not just a writer. I've always thought his simple, pure style was genius work and something to aspire to. I wholly applaud Drawn and Quarterly's "John Stanley Library," but was blown away that John Stanley didn't get ANY credit in the Melvin Monster book for having drawn the story. The bio in that book just says he was a writer! I'm really enjoying your "John Stanley's World" articles, Frank! More, please!